We consider the beginning of Barnabas and Paul's missionary journey in Acts 13. 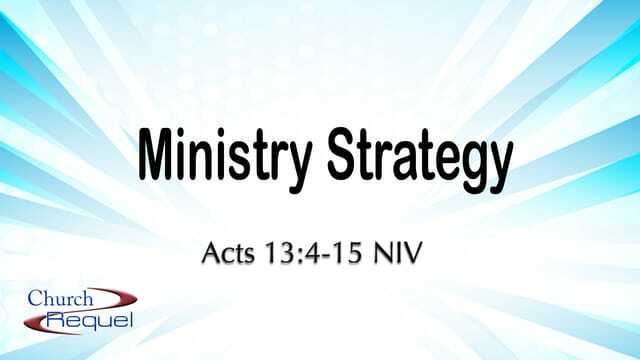 What can we learn from their experiences that can help us in our own ministry strategy? We'll learn four principles to follow when we begin any new work for God's kingdom. We see a pattern of ministry outreach followed through the rest of Acts. It's still a good pattern to follow for our ministry today. #1 - ___________________ with other Christ-followers. There are no lone ranger Christians. You need to be in church! And there are no lone ranger ministers. You need to partner in ministry! Especially when you're excited to get something started and just want to get going... STOP. Find a partner or more. Pray about it. If God is truly calling you, He will be calling someone else to partner with you. The end result (ministry) will be much stronger for it! #2 - _____________ the Holy Spirit's lead and power. I'm sure you have seen this one by now, but just about every chapter in Acts is filled with the leading of, the power of, the guidance of the Holy Spirit. In any ministry you pursue, you WANT to be sent on your way by the Holy Spirit! You will need Him! I'm so impressed by the genuineness of what is happening by the March of Prayer. On April 3 many pastors and prayer warriors are gathering here to pray and ask Holy Spirit, "What's next?" Not only do you want Holy Spirit's leading, you must have His power! We will talk more about opposition in a moment, but you must have Holy Spirit's power to succeed in ministry (and remember that each one of you is a minister.) Paul was naturally outgoing and even confrontational. So we could understand Paul confronting the enemy. But even with Paul, there was Paul... and then there was Paul + the Holy Spirit. Luke wanted to make sure we knew this confrontation was Holy Spirit led and powered. #3 - _____________ the gospel at home. This one might surprise you, but it's important and it's one we mess up all the time. Start at home! Why is it we want to start at the ends of the earth first? This may be why we struggle so with our consistency. We are one kind of Christian at home or work or school, and then another kind of Christian when we put our ministry cap on. Could be why the church struggles with the 20-40 age bracket. We always think of this in financial terms. But how much MORE TRUE is this when it comes to ministry and faith leadership! Start at home! Don't win the world but lose your family! A. ________________ from the enemy and from within. This was just the beginning. They were expelled from the Perga region. The Jewish leaders in Iconium stirred up the Gentiles against them. The city was divided. They were mistreated and stoned. They had to flee to Lystra and Derbe, where the crowds loved them so much they wanted to sacrifice to them as Gods. But then Jews from Antioch came and stirred up the crowds to stone Paul. They dragged him to city limits thinking him dead. One place after another saw victory followed immediately by persecution. NOT an easy life. EASY to be discouraged. Not the worst! Anyone who is a veteran of ministry will tell you that the most challenging opposition is the opposition that comes from within. From friends. Those you thought you could count on don't stick it out. Abandon you. That hurts the most. John Mark leaves them. It's just too much. Paul feels betrayed. Barnabas feels disappointment. No matter how much you expect it, it still hurts when it happens. Whenever there is opposition, look for opportunity! B. ___________________ for the gospel. That was all the encouragement Paul needed! They had a great week. The next Sabbath the whole city shows up to the synagogue. Jewish leaders become jealous and heap abuse. This is the cycle. Opportunity followed by opposition. Opposition followed by opportunity. Effective ministry, ministry that counts for the Kingdom of Heaven cannot always be measured on the day or the week it is delivered. And if we tried to measure it, we would surely often think we have failed miserably. Ministry is not for the faint of heart. Ministry is not for the loner. Ministry is not for the one without God's Holy Spirit to guide and lead him. In this church everyone is a minister. Are you ready? Are you up to the challenge?